March 29, 2013  The Afro-Caribbean people known as the Garifuna have a rich tradition of music, dance and storytelling much like their forebears. They also have another parallel to Africa: a severe HIV and AIDS epidemic. The Garifuna are using their culture as a weapon to fight the spread of the virus. March 28, 2013  Deep in the Amazon, an isolated Brazilian tribe almost vanished when it first had contact with the modern world. Now the Surui tribe is working with Google to do things like report on illegal logging in the forest. March 28, 2013  The first female Attorney General of Guatemala is taking on some of the country's most powerful kingpins, past dictators and local crime bosses. She's lowered the Central American nation's high crime rate and brought justice for victims of the 36 year old civil war. March 27, 2013  Brad Guzan swatted away shot after shot and the U.S. team hung on for a 0-0 draw with Mexico Tuesday night. The U.S. earned only its second point in a World Cup qualifier at Azteca Stadium. March 26, 2013  The U.S. and Mexico have a long rivalry on the soccer field. They take the field again Tuesday in a game that holds political, cultural and competitive importance. It's a World Cup qualifier. 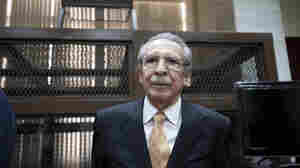 March 20, 2013  The genocide trial of former U.S.-backed Guatemalan General Ephraim Rios Montt began Tuesday. The charges stem from the bloody civil war which lasted for more than three decades. More than 200,000 people died or went missing. March 19, 2013  Tom Goldman talks to Robert Siegel about Tuesday's World Baseball Classic championship game in San Francisco. March 18, 2013  Former military ruler Efrain Rios Montt, now 86, presided over one of the bloodiest periods in Guatemala's 36-year civil war. 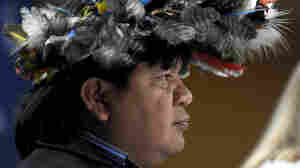 During his rule, thousands of Guatemala's Indians were killed. 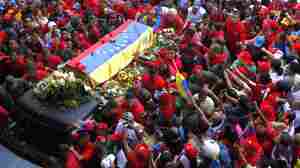 March 15, 2013  Ten days after his death, Hugo Chavez's remains are being moved to a museum after being on display at a military academy. The government has been debating what to do with the body long term. His political heirs simply say they want to keep his memory and image alive. March 14, 2013  Audie Cornish talks to Michael Warren, Buenos Aires Bureau Chief for the Associated Press, about Pope Francis and his time with the Roman Catholic Church during Argentina's "dirty war" in the late 1970s and early 1980s. March 14, 2013  Following celebrations for the historic election of Argentine Pope Francis, it's time to look at the business of leading the world's 1.2 billion Catholics — bureaucracy and all. Host Michel Martin discusses the Pope's future agenda with Reverend Jose Hoyos, of the Diocese of Arlington, and religion professor Anthea Butler. 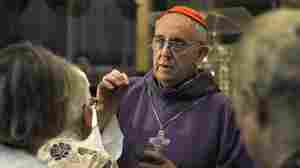 March 14, 2013  Pope Francis is widely revered for his many years of work with the poor. But he has not been immune from criticism in a country that has gone through tumultuous times. March 14, 2013  Renee Montagne speaks with Hugh Bronstein, a Thomson Reuters correspondent in Buenos Aires, about what the election of Pope Francis means to Argentines. March 13, 2013  Melissa Block talks to Philip Reeves about reaction to the selection of a new pope to lead the Catholic Church, Cardinal Jorge Mario Bergoglio of Buenos Aires, Argentina.